David DiS­al­vo, a sci­ence and tech­nol­o­gy writer whose posts we share with you reg­u­lar­ly, has just pub­lished his selec­tion of the 2010 psy­chol­o­gy stud­ies real­ly worth know­ing about. A great tour of the brain and psy­chol­o­gy that leads us from how many of our wak­ing hours are ded­i­cat­ed to day dream­ing, how the impres­sion we are try­ing to give when meet­ing some­one influ­ences how we eval­u­ate the oth­er per­son, to how a con­fi­dent pos­ture gives a bio­chem­i­cal advan­tage that increas­es feel­ings of pow­er and tol­er­ance of risk. Enjoy! (Editor’s Note: we are pleased to bring you this arti­cle thanks to our col­lab­o­ra­tion with Greater Good Mag­a­zine). We’ve all been there: obsess­ing over a faux pas we com­mit­ted at a par­ty, infu­ri­at­ed by an unkind word from a col­league, rumi­nat­ing over a tough break-up with a spouse or friend. We suf­fer some misfortune—big or small, real or imagined—and the pain or humil­i­a­tion sticks with us for hours, days, or even years after­ward. But it doesn’t have to be this way. Draw­ing on some of the lat­est find­ings from neu­ro­science, Han­son has spent years explor­ing how we can over­come our brain’s nat­ur­al “neg­a­tiv­i­ty bias” and learn to inter­nal­ize pos­i­tive expe­ri­ences more deeply—while min­i­miz­ing the harm­ful phys­i­cal and psy­cho­log­i­cal effects of dwelling on the neg­a­tive. For years, research has shown that, over time, our expe­ri­ences lit­er­al­ly reshape our brains and can change our ner­vous sys­tems, for bet­ter or worse. Now, neu­ro­sci­en­tists and psy­chol­o­gists like Han­son are zero­ing in on how we can take advan­tage of this “plas­tic­i­ty” of the brain to cul­ti­vate and sus­tain pos­i­tive emo­tions. In his recent book, the best-sell­ing Buddha’s Brain: The Prac­ti­cal Neu­ro­science of Hap­pi­ness, Love, and Wis­dom, Han­son describes spe­cif­ic prac­tices that can pro­mote last­ing joy, equa­nim­i­ty, and compassion—and backs it all up with sound sci­ence. You may have watched the new series Lie To Me, with Tim Roth, based on the work of Paul Ekman. The sec­ond episode, which you can watch for free via Hulu.com Here, is pret­ty inter­est­ing, but the best part hap­pens in the begin­ning, so you only need to watch a few min­utes to learn why what are called “lie detec­tors” are noth­ing but biofeed­back sys­tems that mea­sure phys­i­o­log­i­cal anx­i­ety. Biofeed­back can be a very effec­tive train­ing tool for emo­tion­al self-reg­u­la­tion and stress man­age­ment, pre­cise­ly because it enables a faster feed­back-based learn­ing loop. Indeed, we are see­ing a grow­ing num­ber of appli­ca­tions in the mar­ket, with names such as EmWave, StressEras­er, RES­PeR­ATE, Jour­ney to the Wild Divine, and oth­ers. Sim­ply, don’t believe the tech­nol­o­gy is an effec­tive lie detec­tor. Car­o­line and I wrote an arti­cle on Paul Ekman’s work a cou­ple of years ago — let me repub­lish it now, giv­en his work has made it all the way to main­stream TV! 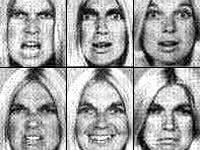 Paul Ekman has con­duct­ed exten­sive research on iden­ti­fy­ing emo­tions through facial expres­sions. As part of that research, and as part of the pow­er of dis­ci­pline and train­ing, he learned how to con­scious­ly manip­u­late 42 facial mus­cles, includ­ing many that in most of us are beyond our con­trol, and even aware­ness. Great news: I have been invit­ed to be one of the blog­gers at that fun news and blog­ging exper­i­ment called The Huff­in­g­ton Post. I appre­ci­ate very much the oppor­tu­ni­ty to engage a broad­er com­mu­ni­ty around the lat­est research on brain fit­ness and the brain fit­ness mar­ket, and around how to “exer­cise our brains” for hap­pi­ness, health, life­long learningÃ‚Â and peak per­for­mance. You can take a look at the first post: How “Say­ing Thanks” Will Make You Hap­pi­er. SharpBrains.com/blog will keep being our main blog. Thank you for all your sup­port!